I can’t believe that #BrunchWeek is finally here! I was so sad to miss out on it last year that my fingers fumbled over themselves in an attempt to sign up this year! I had so much fun coming up with recipes to share with you. For the first time in I don’t know how long, I’ll have a recipe posted every single day this week, weekends included. When I found out that one of our sponsors was Red Star Yeast, my first thought was to make sweet/cinnamon rolls but I knew I also wanted to get more creative than that. On a whim I searched for “yeasted cakes” because aside from a Mardi Gras King Cake, I’d never made a yeasted cake before. 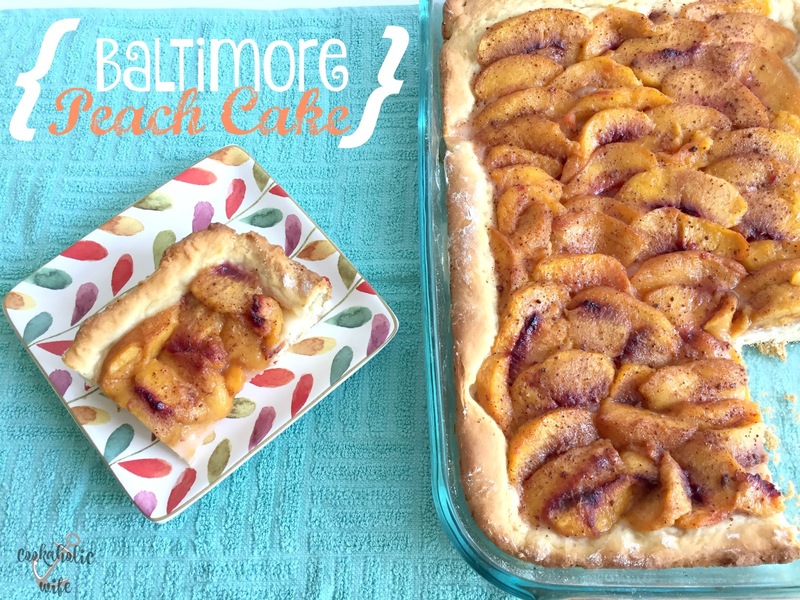 I was shocked to find that the peach cake I’d been eating on and off for the majority of my life was made with yeast and was a Baltimore staple. I guess living here I just thought it was common to serve a square cake slice topped with peaches. The history is that back in the late 1880’s, the eastern shore of Maryland was responsible for producing massive amounts of peaches during the summer season and those peaches would be shipped all over the country. Soon after, recipes for the mildly sweet cake began appearing. 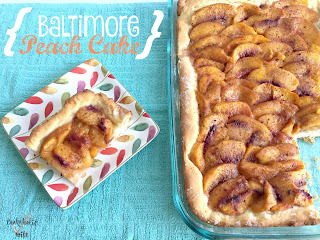 The peach crop isn’t the same anymore so the cake isn’t nearly as popular as it once was, or as other Baltimore favorites like steamed crabs or Berger cookies are, but you can still find bakeries throughout the state serving up slices of this tasty fresh fruit concoction. Back when Baltimore, MD was booming in peach production, this yeasted cake topped with fresh peaches was found just about everywhere. 1. Pour the yeast over the warm water and allow to sit for 5 minutes or until bubbly. 3. Add ¼ cup of sugar, melted butter and salt to the yeast mixture. Pour into a mixing bowl with the dough hook attached. Add the scalded milk and egg to the mixer and start the mixer on low. 4. Add flour 1 cup at a time until a dough begins to form. Use a rubber spatula sprayed with cooking spray to pull dough away from the side of the bowl. Increase the speed of the mixer to medium and mix until a slightly sticky dough has formed. 5. Turn out the dough onto a lightly floured surface and knead for 3 minutes. Transfer the dough to a lightly oil bowl, turn over once to coat and cover with a clean kitchen towel. Allow to rise for 1 hour in a warm place, or until dough has doubled in size. 6. Punch down dough and allow to rise for another 30 minutes. 7. Preheat the oven to 375. Spray a 9×13 baking dish with non-stick cooking spray. 8. After the last rise of the dough, press into the prepared baking dish, making sure the dough reaches the edges. Prick dough with a fork to make sure it will not rise too much. 9. Arrange the peach slices in overlapping layers on top of the dough, leaving ¼ inch or less of a border. 10. Sprinkle peaches with the remaining ½ cup of sugar. 11. Bake for 25-35 minutes or until the dough is lightly browned and cooked through. Transfer to a wire rack. 12. Mix jam flavor of your choice with 1 teaspoon of water and brush on top of the peaches. Sprinkle with the cinnamon. Allow cake to cool for at least 30 minutes before slicing. 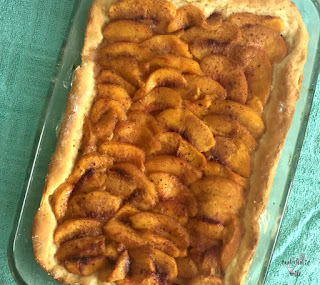 Of course, the recipe is usually made in the summer with fresh, ripe peaches and it’s too early in the season for good ones. Last summer I had frozen two overflowing zip top bags with sliced fresh peaches and opted to use those versus the frozen ones you get from the grocery store. 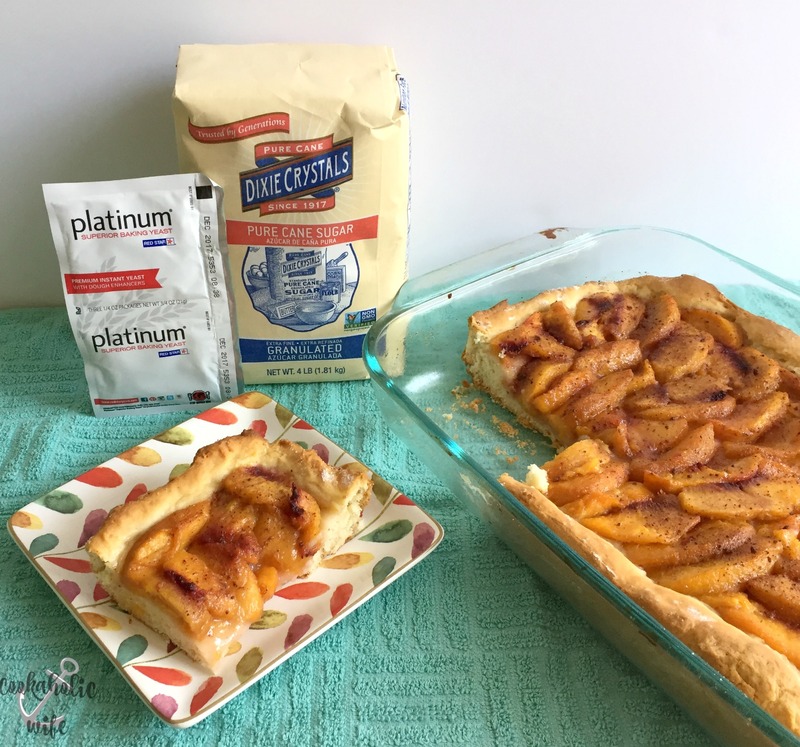 I opted to add a sprinkling of Dixie Crystals sugar over the peaches before baking just to make sure the cake was sweet enough. That combined with the dusting of cinnamon and glaze of rapsberry made the cake just sweet enough to tickle your sweet tooth but not leaving you wondering if you just ended up with a new cavity. I love peach desserts! This looks amazing! I have yet to see any peaches in our markets this season. But, as soon as I do, I know what I'm making! Thanks for sharing. Oh I love this, so simple to make and yet the presentation is great. This looks really good. My husband lived in Baltimore for years and I'm definitely making this for him! Yum! I love peaches and I bet it is incredible in this cake! This cake sounds amazing. So glad you found it.